The proposal to put a biomass plant in southern NSW is heating up again. The following report comes from ABC SE NSW. The head of BioEenergy Australia says she is not opposed to a biomass power plant being built on the New South Wales far south coast. South East Fibre Exports wants to build a plant at Eden to generate electricity from woodchip timber waste. 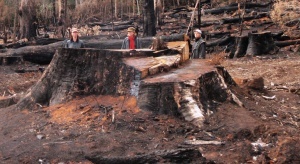 The anti-logging group, Chip-Busters says timber companies are members of the organisation, which is a conflict of interest. But the organisation’s chairwoman, Doctor Roslyn Prinsley says given Australia’s strict harvesting guidelines for native forests, the plant is not unreasonable. “If the forests are being managed sustainably and the waste from the mill is going to be wasted anyway why you wouldn’t use it to produce electricity and displace coal or fossil fuel and reduce our carbon admission so I have sympathy with that viewpoint as well,” she said. Chip-Busters have previously said “Our forests are amongst the most carbon dense in the world, home to a vast array of wildlife and critical to the health of our water catchments and rivers in the face of the looming climate catastrophe. Woodchipping them for paper pulp or biomass energy is just plain stupid”.